Question: Are there key-ins for things like Regen Graphics? I like to use MicroStation key-ins. Answer: I'm not a keyboard kind of guy and I didn't know the answer to this, so I looked into it. I had a sense that it could be done but just didn't know how. I knew there were keyboard shortcuts because you could look at some of the InRoads commands and they were shown right next to the command. But the vast majority of them didn't have a shortcut. 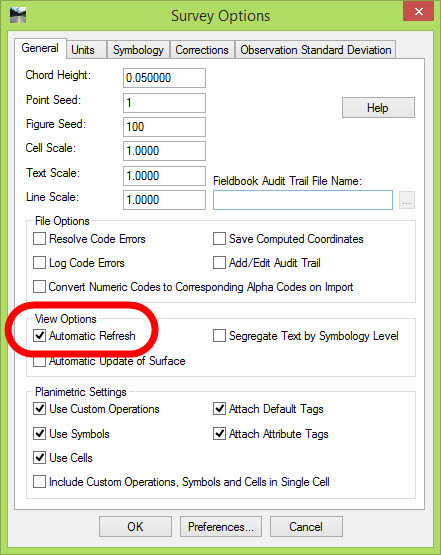 This is actually a great tip for any InRoads or InRoads Survey user who likes keyboard commands. 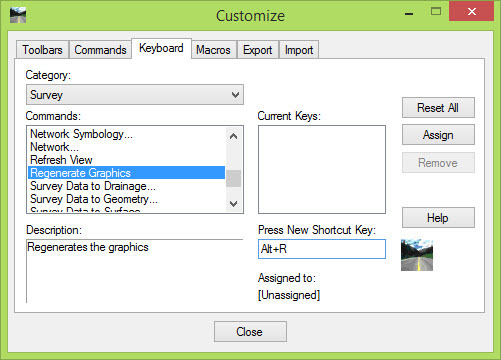 Let's take a command as you mentioned, Regenerate Graphics, and create a keyboard shortcut. 2) Set the Category to Survey. 3) Find the Regenerate Graphics command. 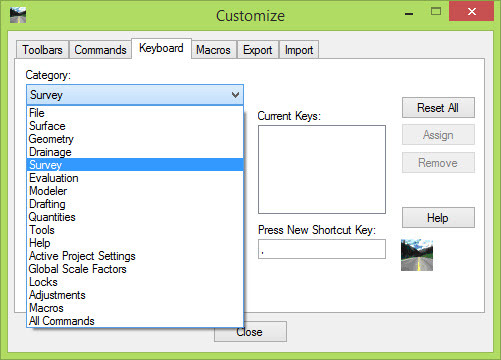 4) Click into the Press New Shortcut Key field and select the keyboard shortcut that you want to use. I'll pick ALT R in my example. 5) It's added. 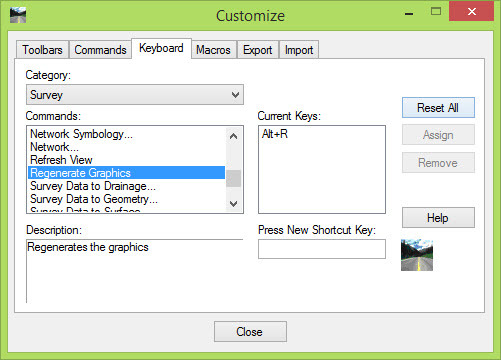 Close the Customize dialog box, and notice that Alt+R shortcut has been added to the menu. The one reason that the Regenerate Graphics in particular is a great choice for a keyboard shortcut is that every time the fieldbook is edited, it regenerates the graphics automatically. Well, only because on the Survey Options, that setting is usually checked on. So, when working with a very large fieldbook, you might not want to process every single edit at the moment that you edit it. That slight processing time can add up if you are making many edits. 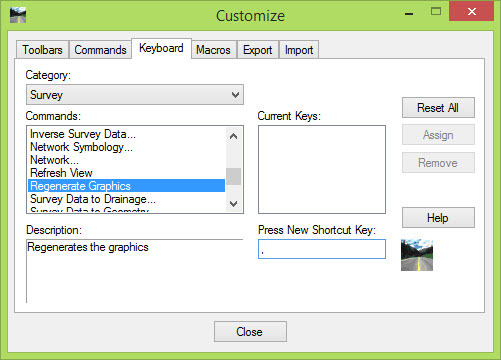 Now you can disable that automatic refresh option, make your edits, and regenerate the graphics with your keyboard shortcut whenever you feel the need. 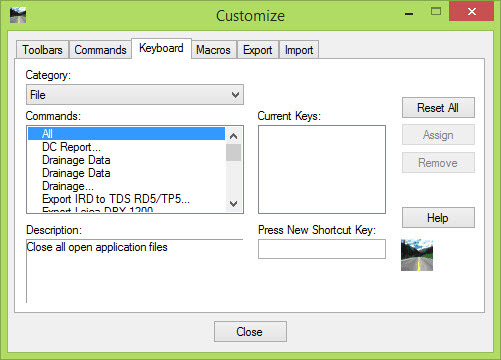 These keyboard shortcuts are stored in the Windows registry just like all of the other customization done through that tool. Something interesting occurred the other day that made me look at what I was doing with Zen. I was heading into a training session in Berkeley, California and someone said something along the lines of 'me' having a good class. I knew what they meant, but the wording struck me as ill-fitting. I said something like "I don't care about me, I care that the attendees learn what they came to learn". It's true. I go into every training class, software support dialog or email with the attitude that I want the person on the other end to discover newfound knowledge or software clarity that they can use when they get back to work. And it's become a core value here at Zen. Marianne will give you a few more details on our new website that is finally up and running, but I'm personally looking toward the future beyond what we are and have been doing here at Zen. That means a lot of work for the Zen folks, but a lot of value for you, the user. As always, contact me as needed. I'm here to support you. - Mark aka "The Zen Dude"